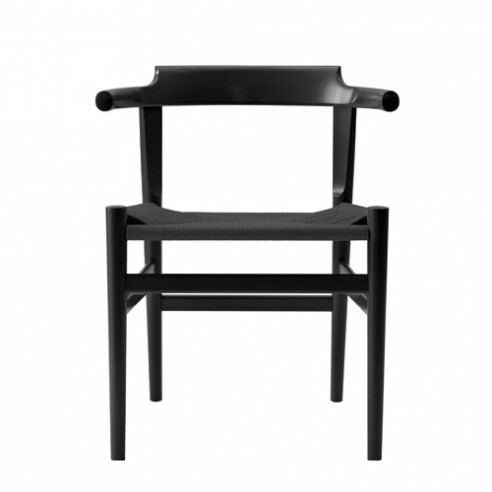 This black version of the Final Chair is made from solid beech with a black papercord seat and finished with a smooth black pigmented lacquer. A very smart silhouette with a beautifully comfortable round back rest. The chair appears to be light as result of the slightly conical legs taper towards to the upper portion of the back legs where they meet the top rail and the milling out of the top rails mid section where it touches the sitter’s back. The tenon joints have been tested to withstand one ton of pulling strength that will outlast everyday use throughout your life – and your children’s and your grandchildren’s. In 1987 aged 73 years old, Hans J. Wegner proved without doubt his master design skills and craft with his final dining chair PP68 guided by all he had learnt. • The Chairs must allow one to sit in alternate positions and be comfortable. • The Chairs must allow one to sit in alternate positions and be comfortable.The chairs must provide the correct support for the elbows and the back. chairs must have plenty of space below the back rest, so as to leave plenty of room for the behind. The Final Chair is designed to be affordable and practical and as with many of Wegner’s other chair models it is available in this version PP68 with a seat of woven papercord or with an upholstered seat PP58, which has a slightly different construction to the chairs frame. Both chairs PP68 and PP58 are clearly descended from Wegner’s earlier ‘Cow Chair’ PP505 and ‘Bull Chair’ PP518, the so called called ‘Livestock Chairs’ in that the top rail is reminiscent of a pair of horns that can be pushed up against a table. The short armrests of pp 68 makes it easy to enter and move around the chair and like the ‘Cowhorn Chair’ are shortened so that it tucks neatly away the table. Space-saving is further enhanced as the chairs can also hang from a table top to make cleaning the floor easier. ‘The Final Chair PP68’ is modern and robust, with a simplicity that is attractive even when painted and colours chosen for this version of the chair were made in collaboration with Hans J. Wegner’s Design Studio. They include ‘Japanese Red’, a combination of red and brown which Wegner was personally very fond of.